The bill requiring Photo ID for voting in Ohio (HB 159) is expected to come up for a vote in the Ohio Senate this Tuesday 9/27/11. To amend sections 3501.01, 3503.14, 3503.15, 3503.16, 3503.19, 3503.24, 3503.28, 3505.18, 3505.181, 3505.182, 3505.183, 3509.03, 3509.031, 3509.04, 3509.05, 3509.08, 3511.02, 3511.05, 3511.09, and 4507.50 of the Revised Code to generally require electors who appear at a polling place to vote or who cast absent voter's ballots in person to provide photo identification, to establish a process for electors to receive free photo identification, to establish a process to permit electors with a religious objection to being photographed to vote, and to revise the information that must accompany a provisional ballot for that ballot to be eligible to be counted. With more than can be counted examples of illegal immigrants voting illegally, and with OH being a known battleground state for the Presidency, it is important we protect the integrity of the voting process in Ohio. The OH Senate passing HB 159 will minimize the chance of illegal immigrants and non-residents from voting in Ohio. The OH Senate, though having a GOP majority, is not the bastion of conservatism as you may think. The vote on requiring Photo ID for voting has been put off by the Ohio Senate since June. WHY? Because of this, we must let them know keeping the highest standards in voter integrity is of the utmost importance. It is important pressure be put on the GOP members in the OH Senate to pass HB 159. The question is very simple... if you cannot provide an ID proving who you are and that you are a resident of OH -- why should you be allowed to illegally vote in elections affecting Ohio? Trying to make air cleaner than God ever intended -- The EPA! WASHINGTON, D.C., September 13, 2011 – New legislation introduced by Sen. Mike Johanns (R-Neb.) that would prevent the Environmental Protection Agency from regulating naturally occurring farm dust is welcome news for the nation's farmers and ranchers, according to the American Farm Bureau Federation. "Regulation of farm dust by EPA could severely hamper the ability of farmers and ranchers to meet the world’s food needs," said AFBF President Bob Stallman. EPA is reviewing existing regulations for particulate matter, which includes soot and dust. Soot is generated by car emissions and factories; dust occurs naturally. According to Stallman, planting and harvesting crops, livestock moving from place to place and people driving down dirt roads are just a few of the ways dust occurs naturally on farms and in rural areas. "The current rules pertaining to dust are adequate," said Stallman. "Increased regulation of farm dust could result in decreased productivity and higher food prices, coupled with lost jobs in the rural economy. Moreover, the scientific basis for establishing such regulation has been called into question and it has not been demonstrated that the benefits of EPA regulation would outweigh the costs." The new legislation introduced by Johanns prevents EPA from making dust regulations even more stringent, while taking health concerns into consideration. Richmond, VA – Today, the Fourth Circuit Court of Appeals issued a ruling on the Patient Protection and Affordable Care Act (commonly known as “ObamaCare”) in the case of Liberty University v. Geithner and issued a separate opinion on the case of Commonwealth of Virginia v. Sebelius. Liberty Counsel represents Liberty University and two private individuals, challenging both the individual and the employer mandates in ObamaCare. The panel of judges for the case included one judge appointed by President Clinton, Judge Diana Gribbon Motz, and two judges appointed by President Obama, Judges Andre M. Davis and James A. Wynn Jr. Judge Motz wrote the opinion, in which Wynn concurred. Judge Davis wrote a dissenting opinion. In the case of Liberty University, the divided court ruled that the mandate is a “tax” under the Anti-Injunction Act (AIA), and thus the court does not have jurisdiction to rule on the merits until the “tax” is paid and a refund sought by the taxpayer. Thus, the case could not be brought until the mandate becomes effective in 2014. Every court which has considered this question has found that the mandate is a “penalty,” not a tax, and the AIA does not apply. Even the federal government defendants argued that the AIA does not apply and that the statutory intent clearly indicated that the AIA was inapplicable. In the Virginia case, the court ruled 3-0 that Virginia does not have standing to bring a challenge to the individual mandate, because that right is for individuals affected by the mandate. In the case of Liberty University, the next and final stop in the battle over ObamaCare will be the United States Supreme Court. Liberty Counsel will file a petition with the High Court. The main thrust of the mandates in the federal healthcare law allows the government to take an unconstitutional control over the freedom & liberty of the American public, more than they are about reforming or making healthcare more affordable. And this is just another one of many reasons why it is so important that in Ohio we take the needed steps to protect our God-given and Constitutionally protected rights, and that can be done by passing Issue 3, "The Ohio Healthcare Freedom Amendment" this November. HOW BADLY DO YOU WANT TO DEFEAT OBAMACARE IN OHIO AND SEND A BIG MESSAGE TO WASHINGTON THIS NOVEMBER? Because of your help and support the Healthcare Freedom Amendment petition succeeded and is now Issue 3 on this November ballot! Now it’s time to Get out the Vote and offer our support for Ohioans for Healthcare Freedom - go to http://ohioansforhealthcarefreedom.com - the primary organization running the campaign to get Issue 3 passed. Going door-to-door to get out the vote. Visiting a local phone bank to make telephone calls. Visiting local businesses and organizations to distribute posters and brochures. Putting together the brightest minds from his team of bedazzling bureaucrats and Department heads, President Obama will be giving a much anticipated speech on a jobs package for Americans. "There are few other ways that can directly put money into the economy than applying unemployment insurance," Carney said. Carney answers the question: "It is one of the most direct ways to infuse money directly into the economy because people who are unemployed and obviously aren't running a paycheck are going to spend the money that they get. They're not going to save it, they're going to spend it. And with unemployment insurance, that way, the money goes directly back into the economy, dollar for dollar virtually." "Every place that, that money is spent has added business and that creates growth and income for businesses that leads them to decisions about jobs, more hiring. So, there are few other ways that can directly put money into the economy than applying unemployment insurance, Carney said. To see President Obama's job package for illegal immigrants, click here. With the unemployment rate slowly creeping up to meet Presdient Obama's plunging poll numbers, President Obama, through the U.S. Department of Labor, has taken bold steps to get people working. The U.S. Department of Labor told CNSNews.com in a written statement on Wednesday that it will enforce the federal wage laws on behalf of anyone working in the United States “regardless of their immigration status.” The statement was in response to a written question from CNSNews.com. After issuing his recent Executive Edict of granting amnesty to over 300, 000 illegal immigrants, it only makes sense President Obama would again flout the law and push this illegal immigrants jobs package. How else couldthey to donate to his campaign fund? 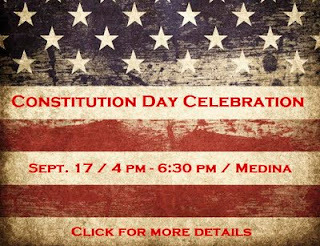 In an effort to energize and educate citizens about the Constitution and its importance, the Medina Tea Party Patriots are hosting a Constitution Day Celebration on Saturday, September 17th. We invite you to join us as we reclaim the truths and liberties that are found within this extraordinary document. What was a significant moment for our nation has sadly become an afterthought for many in our culture today. It seems Americans have forgotten the significance and meaning of the Constitution, which grants us freedom and liberty, and our elected officials have forsaken the very document our founders masterfully created. What is a significant moment now is how the U.S. Constitution is under constant attack by the left. It is important, now more than ever, that we as Americans, embrace and hold dear the the document protecting our God-given rights and assuring our freedoms & libertys as citizens of the United States.